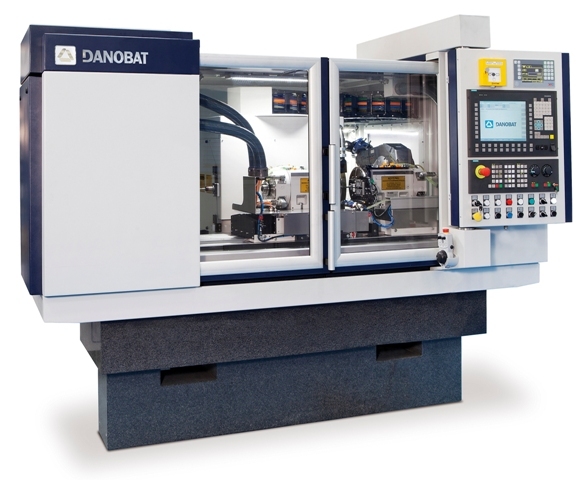 The LG-600 is the largest of three models in DANOBAT’s LG range of horizontal configuration external and internal grinding machines, capable of grinding a 300 mm external diameter within a maximum between-centres distance of 600 mm. Out-of-round grinding of components such as cams is also possible. Developed for the large batch production of small parts, such as cutting tools, hydraulic precision components and automotive parts, the machine’s natural granite base supports a wheelhead driven by a water-cooled electrospindle holding a 500 mm diameter wheel. This produces a maximum peripheral wheel speed of 120 m/sec and covers the range necessary for grinding with conventional abrasive (45 m/sec) or superabrasives (20 to 120 m/sec) with maximum torque. The LG-600’s slides are driven by linear motors located on preloaded linear bearings and controlled by a Siemens Sinumerik CNC system via optical scales. A combination of conventional abrasive and high speed grinding is possible by specifying an optional multi-wheel B axis equipped with grinding spindles to suit potential customers needs. Other options include automatic loading/unloading.by means of an integrated gantry, developed by DANOBAT, or integrating a load/unload robot.